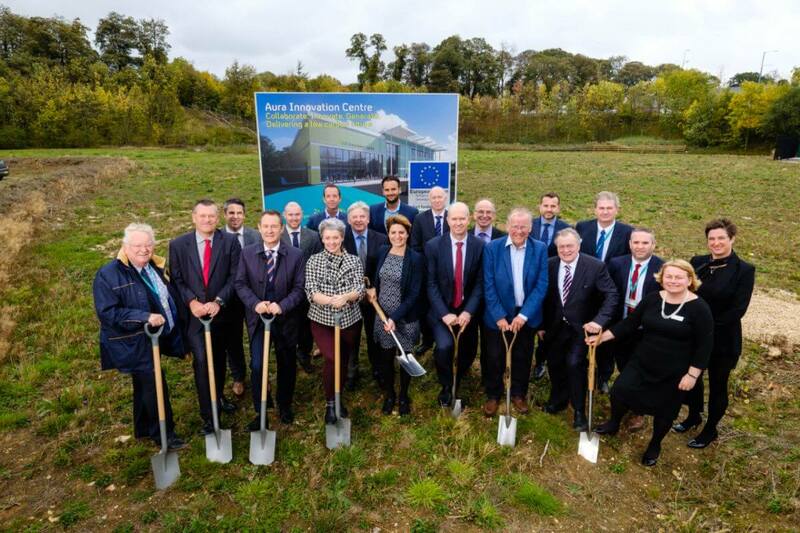 A ground-breaking ceremony has marked the start of construction on the Aura Innovation Centre (AIC) at Bridgehead business park. The centre will provide both large businesses and small and medium-sized enterprises with space to collaborate and innovate, working with the University of Hull and other partners. The centre’s work will support the development of low-carbon energy industries and clean growth, building on the Humber’s reputation as the UK’s Energy Estuary. The event was timed to coincide with Green Great Britain Week, which highlights the opportunities clean growth offers the UK and aims to raise understanding of how business and the public can contribute to tackling climate change. Hull West and Hessle MP Emma Hardy, whose constituency includes Bridgehead, broke ground at the site to mark the start of construction of the centre, which is expected to be completed at the end of 2019. She said: “I am absolutely delighted to be present at the start of what I hope will be a tangible and practical enterprise to grow low-carbon industry here in the Humber. The event was hosted by Lord Prescott, who has long championed the push towards meeting climate change commitments in the UK and globally, and Dr David Richards, Pro-Vice Chancellor for Business & Research at the University of Hull. The Aura Innovation Centre will provide a collaborative space to foster innovation and research to address the challenges faced by the offshore wind and low-carbon energy industries. It will also focus on developing and rooting an effective low-carbon energy supply chain in the Humber, supporting the region’s regeneration and contributing to clean growth, which is central to the UK’s Industrial Strategy. 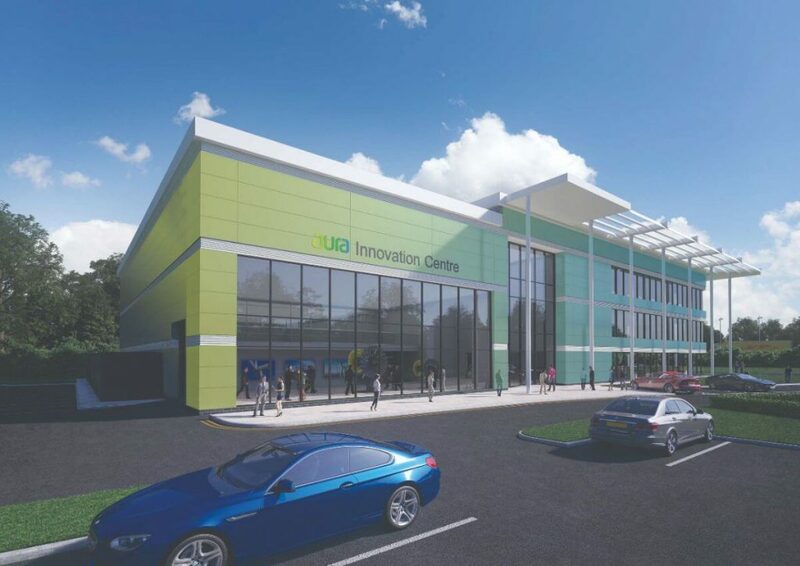 A computer-generated image of the Aura Innovation Centre, which is being developed at the fast-growing Bridgehead business park. The centre has gained funding of £12 million from the European Regional Development Fund, GreenPortHull and match funding from the University of Hull. Dr Richards said: “As the anchor institution in the region, the University of Hull is a strong supporter of clean growth and our financial commitment to the Aura Innovation Centre demonstrates that we mean business. Lord Prescott said: “Climate change is one of the greatest threats to the planet and our economy. A lot has changed for the good since my involvement with the Kyoto Treaty 20 years ago and there is still a lot to do. The fast-growing Bridgehead business park is owned and developed by Hull-based regeneration company Wykeland Group. It is home to a community of blue chip businesses, with almost 1,000 employees now based at Bridgehead. Wykeland Managing Director Dominic Gibbons said: “We are delighted the University of Hull has decided to locate Aura Innovation Centre at Bridgehead and we are looking forward to delivering the physical facility in partnership with them over the coming months. “The start of construction of the AIC is another milestone in the development of Bridgehead business park. It reinforces Bridgehead’s reputation as the location of choice for industry-leading companies and facilities of vital importance to the economy of the region, such as Aura. Matthew Wright, UK Managing Director for global offshore wind leader Ørsted, who was also present at the ceremony, said: “The Aura Innovation Centre can make a real difference in driving innovation across the offshore wind industry. Offshore wind is already a huge UK success story and it can be the backbone of our future energy system as we continue to bring down costs and build projects at scale. ©2019 Wykeland - Rights Reserved.